Master the basic rules of Squash 57 below. Looking for the full rules? Download the rules for singles and doubles (PDF). 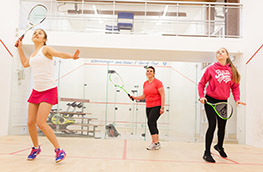 Squash 57 is played between two players on a squash court using a standard racket each, and a ball approved by England Squash. (a) The right to serve is decided by the spin of a racket or coin. Thereafter the Server continues to serve until they lose the point; the opponent then becomes the Server. (b) At the beginning of each game and each hand, the Server has the choice of serving from either service box and shall thereafter alternate for as long as they score points and remains the Server. c) The ball, before being struck, shall be dropped or thrown on to the floor, without touching the wall; it must be served direct on to the front wall between the tin and the out of court line, so that on its return, unless volleyed, it falls to the floor within the back quarter of the court opposite to the Server’s box. (iv) If the striker, in the act of playing the ball, touches the opponent.